« Chapman and Brady: joining the club 46 years apart. Arsenal’s first league match of the 1923/4 season was to be played on 25 August and there were two pre-season friendlies (I suspect the Reds against the Blues or First Team against the Reserves, as normal) on the two Saturdays prior to the kick off. And so, probably in common with most other professional teams, Arsenal’s players returned from their vacations to start training on Wednesday 1 August. As I noted in the last episode, the whole episode of Rutherford leaving to manage Stoke is fraught with contradictions – which is not to say he wasn’t offered the job and hadn’t already gone to start work at the club, but rather that it is a story that reveals some interesting and exceptionally contradictory information about what happened. That of course might well be true. Sir Henry was never one to treat fools gladly, and “fools” can often be a valid description of football journalists who write as if they know all the facts when in fact most of the time much remains hidden from their gaze. As to whether the event Bourke refers to is the same one as that which was the farewell to Rutherford, we can’t say. There are records of Sir Henry taking members of the club out to dinner – right from the earliest days at Highbury, so there could have been another event. But Sir Henry had been formally warned by the League in 1913 about his newspaper commentaries about matches, and it probably grieved him that the journalists could get away with saying anything they liked while he was restricted – even though his suggestions at the time that match fixing was prevalent in football, were proven to be correct. On 6 August the club published its annual report showing a profit for the year of £5000. That would be over a quarter of a million pounds in today’s money just based on inflation. But we must remember football inflation is way above general inflation. £5000 in 1923 was about the world record for a transfer. The world record currently (2018) is £198m. I am not saying that Arsenal’s profit was equivalent to £198m, but it was exceptional and what’s more the long running debt to Humphreys Limited (who had built Archibald Leitch’s grandstand at Highbury) had finally been paid off. The club was still not debt free, for the accounts show loans of £8510 from Sir Henry Norris and William Hall still on the books, and a further list of other creditors with claims totalling £4344, presumably including the bank. But one huge debt was out of the way at last. The point about these figures is that despite the clubs ups and downs in the League, the great gamble that Arsenal would flourish in a large stadium in north London, near to public transport links, surrounded by the homes not of men who worked in factories but the men who worked in the City of London running the Empire, had again been proven to be a valid prediction. It had been an incredibly bold move by Henry Norris to suggest this move after his alternative rescue plans had failed to gain support in 1910, but amazingly it had worked. Then on 8 August Leslie Knighton once again showed that he could find and sign talented players. If he had a problem it was that he simply couldn’t do it often enough. This player was Jimmy Brain from Ton Pentre, a team that still plays in the Welsh League. Jimmy was born in Bristol, had an unsuccessful trial with Cardiff, before becoming a miner in the Rhonda Valley at which time he joined Ton Pentre as a part time player. The signing suggests that the network of scouts that Knighton made so much of in his autobiography had not been wound up by Sir Henry Norris as Knighton later suggested, as this really does look like a signing based on what a player might do, rather than what he had done. An Arsenal scout on the lookout for talent must have tipped the club off. And although I am critical of Knighton in these pages, it should be noted my criticism is of his attack on Sir Henry Norris and the poor form his teams often showed, not on his ability as a manager who could see potential in non-league players. Apart from Jimmy Brain who scored 125 goals in just 204 league games, Knighton had recently brought in Alex Mackie from Forth River, Jock Robson from Innerleithen, Sansen Haden from Castleford Town, Jack Butler from Dartford and of course Bob John from Caerphilly. This was no meant set of achievements, and it is a shame that he should deny his own successes with finding such players by ceaselessly blaming the club owner. 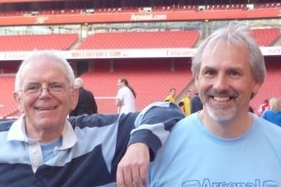 The first of the two pre-season games was on 11 August, a match which was open to the public and press, and the Islington Gazette article on the match mentions seeing Sir Henry Norris at this game and also at the second warm up match on 18 August. Sir Henry may well have got into the habit of missing quite a bit of the winter months of the season, but he was most certainly at Highbury at the start. 20 August, being the last monday before the season kicked off, saw Atheltic News undertaking its usual preview of the season, which now included a full list of all the squads of the First Division clubs. It should be remembered that there were no restrictions on when players could be signed, nor on how many players a club could have. However all players (except amateurs) were controlled under the Retain and Transfer regulations, meaning that they could not move from one club to another until the club that “owned” the contracted player’s registration, agreed. In the list for Arsenal we find Midge Moffatt, now with a height given as 5′ 3″. There was interest in Moffatt because he had played in all the tour matches at the end of last season and he was the shortest in the squad. There was also some debate as to how Moffatt would fit into the squad. He had played all his games on the tour at outside right, and was thus seen as the natural successor to Rutherford, although Rutherford himself had only played 26 out of 42 games last season. Baker for the most part was the player covering this position when Rutherford did not play. As we know, Moffatt didn’t get his chance at Arsenal in the League – Knighton’s story being that Sir Henry Norris, on seeing him in the pre-season games thought him too short and effectively banned Knighton from signing smaller players. But as noted before this seems an unlikely scenario: Arsenal had brought in a singularly short goalkeeper in the previous season to great success, and not only did Moffatt not play for Arsenal, I can find no record of him playing for any League club at all. If he had been a viable choice one would have expected him to turn up somewhere. Sir Henry may have turned Moffatt down after seeing him in the pre-season games, but probably on form, not on height. Davis also notes newspaper talk on the lack of transfer action throughout the league during the summer – it is interesting to note that papers over 90 years ago taking a particular interest in transfers exactly as they do now. And we can note that this was the time Sir Henry was pressing the League to investigate and regulate transfers, particularly with a view to keeping fees under control. The League did indeed investigate the whole process during this season, and took evidence from the clubs, but in the end decided to make no changes to the regulations. The one newcomer is Harry Woods playing at inside right. After the war he had played for South Shields before moving to Newcastle United in January 1922 for £2600 – a fee that for a few months was the world record although it was quickly exceeded by the £5000 West Ham paid a few months later for Puddefoot. Harry didn’t settle with Newcastle only playing 16 games and scoring two goals and moved to Arsenal on 28 June 1923, making the first game of the season on August 25 his first Arsenal match. Sadly the result of this first game of the season was as awful as the first game of the previous season – or perhaps worse since Arsenal were at home: Arsenal 1 Newcastle United 4. The crowd however was very encouraging at 45,000, the largest crowd thus far for the first home game of the campaign. Arthur Bourke in the Islington Daily Gazette called the forward line of Arsenal as “disjointed and unworkable”. Certainly although the players had by and large played a lot of games the previous season they had not played them in these positions. Baker was primarily an inside left or right half although he had played 8 games at outside right. Woods as we have seen was new, Young had never played inside left before, and Toner was a very intermittent choice at outside left. The man who they particularly could have done with was Dr Paterson but he did not return to the fray until October. On the other hand the defence for this first match was the defence that had played throughout the second half of the previous season and which had been the core around which the Arsenal revival was built. A totally solid back five in front of a keeper that they knew. They were all still there, but now conceding four goals in one game, whereas it had taken them the last nine games of last season to let in four goals. For the second match of August, away to West Ham, Baker, Young and Toner were all dropped and replaced by Voysey, Boreham and Haden. The defence stayed as it was, the classic 1 to 6 that had been such a success last season. But once again Arsenal lost 0-1. The club which had gone the last nine games of the 1922/23 season without defeat had now lost two in a row. But there is another point to be made here; teams under Knighton simply didn’t seem to start the league programme well. In the table below we can compare what happened at the start of each of the Knighton seasons thus far. One might think that after four seasons in which the best that had happened is that Arsenal had come out evens and the worst that had happened was one win and four defeats, the management might have thought about how they prepared for the season. Especially since 1922/3 was the season in which Arsenal built an excellent defence through the second half of the season, which was now fully in place and undisturbed. And yet as we have seen in this commentary the first two games of the season were lost. Indeed as we will see in the next episode, all four of the opening games were defeats, with a goal tally of one goal scored and ten conceded. All the promise of just three defeats in the last 20 games of 1922/23 was blown away. A full index to all the articles in this series on Henry Norris at the Arsenal which runs from 1910 can be found here.